Life-like red-tailed hawk decoy scares pest birds away from balconies, gardens, fruit trees, buildings and other areas where birds or rodents become a problem. Birds will avoid areas near the decoy, and move on to a more secure spot. Red Tailed Hawks are known for hunting during the day, while most owl species hunt at night when pest birds are asleep. This makes the hawk a more identifiable predator to birds. When birds see the decoy, they will want to avoid the area! 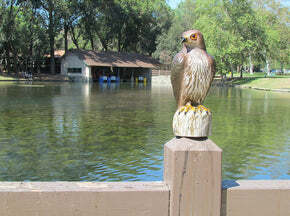 The Hawk Decoy can be used in much the same way as owl decoys. Use the hole in the hawk's base to fill it with sand or gravel to weight it down. Hang the hawk from it's loop conveniently located on top of it's head.